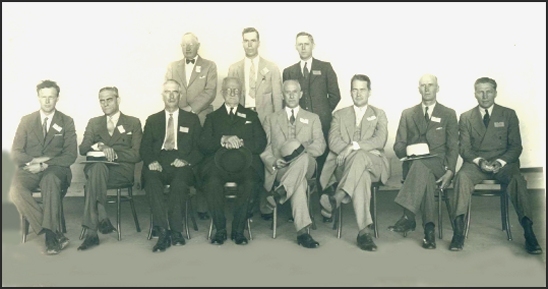 NATIONAL ADVISORY COMMITTEE ON AERONAUTICS, 1934 Seated, Left to Right: Brig Gen Charles A. Lindbergh, USAFR; Vice Admiral Arthur B. Cook, USN; Charles G. Abbott, Secretary of the Smithsonian Institution; Dr. Joseph S. Ames; Committee Chairman Orville Wright; Edward P. Warner; Fleet Admiral Ernest J. 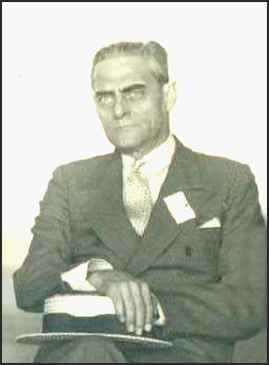 King, USN; Eugene L. Vidal, Director, Bureau of Air Commerce. Biography via email from Helen Cook Laughlin, 1-22-05 Arthur Byron Cook was born in Evansville, Indiana, on December 11, 1881, son of Frederick W. and Eliizabeth (Himmelein), Cook. He was appointed Naval Cadet after attending St. Albans, Notro Domo and the University of Indiana, and entering the U. S. Naval Academy from the First Indiana District in 1900. In 1902, his title was changed to Midshipman, and after graduation in January 1905, he served two years at sea, then required by law, before being commissioned Ensign in January 1907. He attained flag rank on June 12, 1936 when he was aappointed Chief of the Burea of Aeronautics with the accompanying rank of Rear Admiral. He served in the rank of Vice Admiral from July 22k 1943, as Commandant of the Tenth Naval District and Commander Caribbean Sea Frontier and was transferred to the Retired List of the Navy in that rank on December 1, 944. After graduation from the Naval Academy he served for five years successively aboard the Receiving Ship USS LANCASTER, the USS PENNSYLVANIA, after that battleship was commissioned March 9, 1903; the USS DIXIE; and the USS GEORGIA, as turret officer during the Around the World Cruise of the Battle Fleet. His turret stood ONE in the target practice at Madgalena Bay and for battle efficiency he received Letter of Commendation from the Secretary of the Navy. From March 1910 until April of the next year he had duty in the USS SOUTH CAROLINA and on May 30 reported as Assistant to the Inspector of Ordinance at the Works of the New York Shipbuilding Company, Camden, New Jersey. Detached in June 1913, he joined the USS LOUSIANA. Later that year he was assigned duty on the staff of Rear Admiral Henry T. Mayo, USN, Commander First Division, Atlantic Fleet; Second in Command, U.S. Atlantic Fleet; and Commander Battleship Squadron, U.S. Atlantic Fleet. On June 5, 1916, he returned to the Naval Academy, to serve for a year as a duty officer on the Executive Staff. In July 1919 he joined the staff of Commander in Chief Atlantic Fleet, and served as Flag Lieutenant throughout World War I and until June 30, 1919. For World War I service he received a Special Letter of Commendation from the Secretary of the Navy as Follows: "He performed meritorious service as Flag Lieutenant and Fleet Signal Officer on the Staff of the Commander in Chief of the United States Fleet. On August 3, 1919 he reported to the William Cramp and Sons, Philadelphia, Pennsylvania, for duty in charge of fitting out the USS LONG. He assumed command upon her commissioning, October 20, 1919, and had additional duty in command of Destroyer Division 26 for a month before being relieved on April 11, 1921. After completing the Naval War College course in May 1922, he served until June of the following year as Officer in Charge of the U.S. Navy Recruiting Station, Brooklyn, New York. He commanded the destroyer USS CASE from July 1923 until March 1924, and for a year thereafter was Executive Officer of the battleship USS IDAHO. A tour of duty as Coordinator, Sixth Area with Headquarters in Chicago, Illinois preceeded three months on duty (July to October, 1927) in the period he had additional duty with the Third General Assembly of Inter-national Geodetic and Geophysical Union held in Prague, Czechoslovakia, in September, 1927. He returned to duty afloat as Commander Officer of the USS NIAGRA, a Navy Survey vessel from October 19, 1927 until February 20, 1928. Duty in command of the USS LEXINGTON, aircraft carrier, from June, 1934 until April 1936 was followed by another tour of duty for the Bureau of Aeronautics. 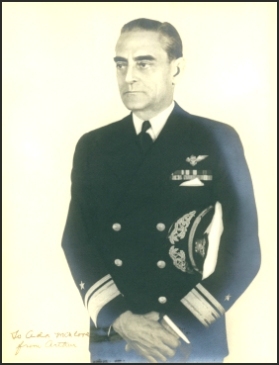 On May 11, 1936, he was appointed Chief of the Bureau with the accompany rank of Rear Admiral. On June 29, 1939 he hoisted his flag in the USS MEMPHIS, as Commander Aircraft Scouting Force. On November 1, 1940, he was transfered to command of Aircraft Patrol Force, U.S. Fleet (title change on January 17, 1941 to Commander, Aircraft, Atlantic Fleet) with his flagship the USS RANGER. In that assignment he had additional duty as Commander, Carrier Division Three. In April 1942, during the early period of World War II, he was ordered relieved of his duty to return to the Navy Department. After brief duty in the Bureau of Aeronautics, he was designated as Chief of Air Operational Training newly established to coordinate all operational training activities of the Navy with Headquarters at the Naval Air Station, Jacksonville, Florida. In August 1943 he was designated Commandant, Tenth Naval District, ........, Puerto Rico, and Commander Caribbean Sea Frontier, with the rank of Vice Admiral. He was awarded the Distinguished Service Medal for exceptionally meritorious and distinguished service to the Government of the United States in a position of great responsibility as Commander Caribbean Sea Frontier and Commandant Tenth Naval District....contributing materially to the successful prosecution of the war. He was relieved ot that command on May 15, 1944, and on Decembe 1, 1944, relieved of active duty and transferred to the Retired List of the Navy. In addition to the Distingished Service Medal, Vice Admiral Cook has the Cuban Pacification Medal (USS DIXIE); the Mexican Service Medal (USS KANSAS); the World War I Victory Medal, Atlantic Fleet C1asp (USS PENNSYLVANIA); American Defense Service Medal, Fleet C1asp; American Campaign Medal, Base C1asp; and the World War II Victory Medal. He also holds the following foreign decorations: Commandeur de l;'Order de la Couronne, from the Belgian Government; and the Legion of Honor, rank of Chevalier, from the Government of France. Vice Admiral Cook was married in 1908 to Miss Mary Amory...of Philadelphia, Pennsylvania. Their children are Mary Amory, Mrs. C.C. Zantzinger, Jr.), and Hobart A.H. Cook. His address is Sulgrove Hotel, 60 East 67th Street, New York, New York. Contributed by Meg Laughlin, 7-29-11 Hi Ralph. I was just looking at the information on the Web about my great uncle Arthur Byron Cook. ( I have several of his letters written to his father F.W. Cook, sister Ada and half-sister Helen.) Ada Cook, my great aunt, was a full sister of Arthur's. Helen Cook, my grandmother, was a half-sister. Just wanted to set the record straight. 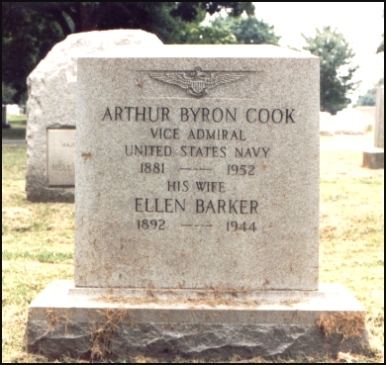 ONLINE RESOURCES If you search for "Arthur B. Cook +Navy +aviation", using the Google search engine, (1-24-05), you will find about 15 links. You will find only brief references to incidents in his career in addition to those in the biography above. However there is one site of particular interest. NACA's 9th Annual Aircraft Engineering Research Conference This page on the GRIN, (Great Images in NASA), website offers a copy of the picture of the group which is seen at the top of this page. In addition, it identifies all of the seated people. Oddly enough, the three people standing in the picture from the collection of Helen Cook Laughlin are absent from the picture on this NASA site. You can access the page by clicking on the title above.